The studio is getting it’s fresh coat of paint! I’m so excited to be moving along on this. Ron got one wall painted yesterday so he could move some of the shelves into the room. He also hung the wall shelves and got one light up on that half of the room. I may have mentioned before that I collect split white oak baskets….handmade only, please. I use them to hold supplies instead of plastic bins. You might see a few odd baskets on my shelves; like a bark basket that stores my safety pins, a Nantucket Lightship basket with Little Red peaking out, a square bamboo that is a little sewing basket and a Victorian bamboo that came from my great aunt’s estate hanging on the wall. The largest basket is my grandmother’s split oak picnic basket. Then there is the Algonquin Indian antique basket that is too fragile to use. Today’s activities while you all are picnicking and spending the last summer days on the beach, will be to sort, fold and organize the fabrics that will go on this 8 ft. bank of shelves. Then we can move on to the rest of the painting and shelving. More pictures as more gets done. Looks great! I collect baskets and use the for storage too…great minds think alike. 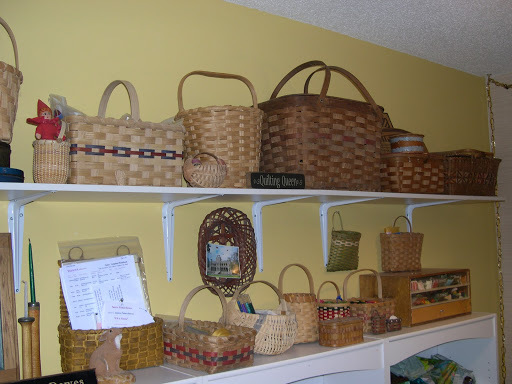 My mother was a basket maker so I have some nice ones, but not split oak…well, I don't really know. I would love to see more studio pix! Thanks Linda! I'll post more pix as things move along. Would love to see some pix of your baskets! Looks like a great use of space. Way too neat! !Get something going girl!! Looks wonderful! Looking forward to seeing more pictures.